We’ve spent some time scouring the web for collections of brilliant handmade, vintage, script and sans serif font bundles that are on exclusive sale with impressive discounts. These font bundles are a great way to get the best value for money when buying fonts and typefaces. These fonts range from wide variety of sans, sans serif to vintage and handmade script fonts. All of these fonts are premium quality, highly regarded in reviews, and would be a fantastic addition to your design library. It’s time to add an air of elegance to your typeface toolbox! And with this beautiful bundle of script fonts from Groens, you can get yourself 20 hand drawn script fonts in one magnificent swirl of a deal. Mixing the classic with the modern, these breathtaking brush fonts are just perfect for everything from wedding invitations to logos to t-shirts! Toss in loads of OpenType features such as swashes, Initial and Terminals Forms, and standard ligatures, and the possibilities are endless. This is a really massive fonts bundle, it includes 56 products fonts and graphics from 12 authors. All the fonts are well crafted and can be used for a number of graphic purposes. This is a big, heavily discounted bundle, including 33 fonts from 11 authors. The deal is absolutely fantastic and give you a huge discount. Hustle Supply Co. has made some best selling fonts over the past year. Everything from Yonder to Growler Script, all the way back to my first font, Native. This bundle highlights the hand drawn style that has taken Creative Market by storm. Now get 12 products (12 Font Files) + extended licenses for all fonts for an incredible 85% off. This is your chance to stock your design arsenal with some of the most popular hand drawn fonts of 2015! This is a limited time offer. Grab these 24 amazing fonts today. This bundle includes 24 fonts + some extras (graphics, vectors, etc). 6 authors are participating in this bundle sharing their talent with a huge discount. A pack of 16 lovingly-crafted, hand-lettered and brushed fonts that have been created carefully to blend harmoniously together in your typographic designs and projects. Already volume 10 from our unique deal format What’s Hot Bundle – 24 custom font bundles from 8 authors in 1 bundle. As always only highest quality & popular custom fonts in one bundle. With more than 93% off + extended licenses available for limited time only, you’ll need to grab this new What’s Hot Bundle while you can. Here’s a fantastic bundle of 4 fonts at brilliant value. Joella is a brand new brush script font with alternates and multilingual glyphs. The thickness of this font makes it great for use with fills such as gold, watercolor, glitter, etc. This fonts bundle is ideal for designs that need a brush or hand-drawn feel, and the pack will give you plenty of vareity to work with! A brilliant set of 28 typefaces (78 fonts) that you can use in your upcoing design work. These display fonts work perfectly for any type of design purpose. Grab the pack for just $50. Dashing displays and slick sans, stencils and handwrittens, vintage and contemporary, you’ll find one of everything you need in this huge hand-picked selection from the creatives at Thinkdust, and all for less than the price of your lunch. I’m proud to showcase a pair of fonts which I have digitized from my own hand lettering. These fonts compliment each other and can be used to create your own handlettering effect for quotes, t-shirts, logos – you name it, you can design it with this pair. Get yer mouse grooving with this Funky Font Bundle of 18 fonts. Everything from calligraphy to handwriting style, these fonts will deliver you the best options for rendering your graphic designs into masterpieces. The bundle has the licenses for all fonts included. With this license you can use any of the fonts in magazine or news paper articles, books, logos, brochures, documents, illustrations, booklets, billboards, business cards, packaging, high-resolution videos, presentations, postcards, calendars, posters, t-shirts, print & presentations templates, where the font lends primary value to the product. 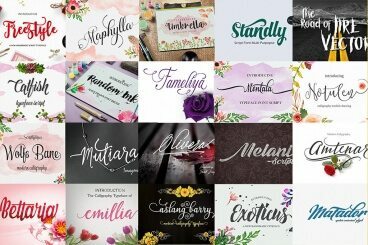 This hand-made script bundle with four fonts is perfect for use in lots of different projects, including your new logotype, wedding invitation, poster, or much more! Get $51 worth of fantastic script fonts, with hundreds of glyphs, ligatures, plus swashes vector for only $19. This is a great deal to take advantage of. I present to you a wonderful Christmas set of all my fonts. The set consists of 24 fonts. It includes both the script and the display. Very suitable for the design of logos, creation of invitations, greeting card and more. Bobby Jones was the first font I ever sold and is one of the primary reasons as to why I continued with font design. 1 week after its launch, a brand that we are all familiar with snapped it up for an international campaign – this was all the motivation and validation I needed to design more. This week I have expanded Bobby Jones from a single weight family to a family of 6 fonts. Within this download you receive OTF and TTF versions of all the fonts listed above. A great addition to your designing arsenal, especially for your vintage / classic design themes. All fonts come in OTF and TTF formats. Plus, this pack comes with an added vector bonus (AI and EPS). A collection of five beautiful brush fonts for only $19. This package offers a great collection of high quality and beautiful brush fonts to use in your projects. If you’ve been patiently waiting for a highly useful, and incredibly versatile brush font bundle, then wait no more! I’ve been working on this trio of fonty goodness for over 5 months, but now it’s time to bundle it up, and tack on a super sweet price tag. Get $39 worth of gorgeous brush fonts, over 200 hand drawn and painted vector elements, plus ink splatters and textures for only $19. Enjoy the new pack of beautifully natural hand drawn fonts for your next projects. This collection contains our carefully crafted typeface to make your messages stand out of the crowd. You may want to use it for wedding invitation, greeting cards, poster, quotes, t-shirt, christmas cards, or everything you think it suits. A bundle of five vintage typefaces that includes great scripts and fonts. Get your hands on this brilliant pack for just $20. Apply these fonts on your vintage design with perfection. Introducing the sans serif bundle, it includes all of my best selling and favorite sans serif font families at a discounted price of $30. Introducing to you this incredible “Super Script Bundle”. A collection of 25 premium fonts from six top creators for just $19. This pack includes 20 weights from 5 font families, over 100 hand drawn vectors, hundreds of bonus glyphs including language support across the board, 3 custom brushes, 16 swashes, 15 vector ink splatters, and a few alternate fonts all rolled into one must have font bundle. A friendly sans serif typeface with rounded corners, Gunnar Bold is ideally suited for display, advertising, packaging, logotypes and signage. This bundle features authentic handmade fonts from ThunderPixels, including American Handmade Typeface, Eighty One Typeface, Victory & Glory TP + Extras, Gilmost Mill’s TP, and GrandGibson Typeface.